The eLock can be used in many applications - drug & supply cabinets, refrigerators and freezers, emergency vehicles - anywhere access control is needed or required. 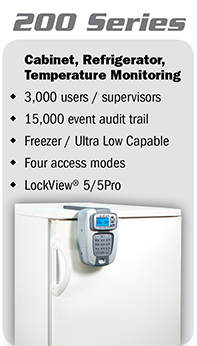 The CompX eLock 300 Series is a keyless, network access control lock for cabinetry and cold storage. The network function allows two-way (eLock and LockView 5) communication on existing network systems either by 802.11g wireless or Ethernet connection. Additionally, temperature monitoring is available with the cold storage version with or without access control and records up to 500,000 data points. The escalating notification system sends temperature "out of range" alerts to a list of responders helps prevent product loss. 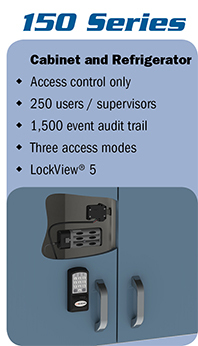 300 Series eLocks offer up to 3,000 unique user codes, audit trail capabilities, and the ability to read existing identification cards. Both versions are powered by AA batteries and feature the convenience of automatic relocking. Click to read more. 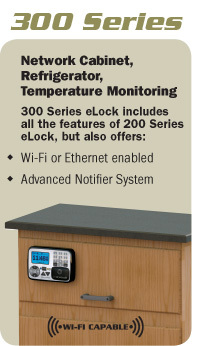 The CompX eLock 200 Series is a keyless, non-network access control lock for cabinetry and cold storage. Additionally, temperature monitoring is available with the cold storage version with or without access control. 200 Series eLocks offer up to 3,000 unique user codes, audit trail capabilities, and the ability to read existing identification cards. Both versions are powered by AA batteries and feature the convenience of automatic relocking. Click to read more. 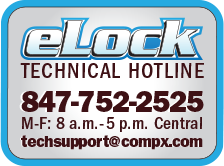 The CompX eLock 150 Series is a keyless, non-network access control lock for cabinetry and cold storage. 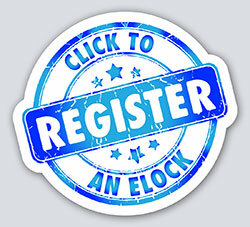 150 Series eLocks offer up to 250 unique user codes, audit trail capabilities, and the ability to read existing identification cards. Both versions are powered by AA batteries and feature the convenience of automatic relocking. Click to read more.